Hi I’m Jay! I live with my mom and dad on “Can Do” Street. I am a Native American. I’m a member of the Turtle Mountain Band of Chippewa Indians. My grandparents live in North Dakota where many members of my tribe call home. I look forward to summer all year long. That’s when I get to visit my grandparents and take part in my tribe’s activities. I go to “Can Do” Street Grade School and I’m a good student. I like games, especially ping pong. Lots of times I am the team captain during tournaments. My best friend is Bobby. Bobby is very good in math, but not so good at ping pong, so sometimes, during tournaments, I ask him to be the score keeper. When you get a chance, come to “Can Do” Street and watch me play ping pong! It’s Saturday and some of the “Can Do” Kids are holding their cooking club at Grandma Maureen’s house. They are making one of their favorite snacks to share with their friends at the community center after the ping-pong match in the afternoon. 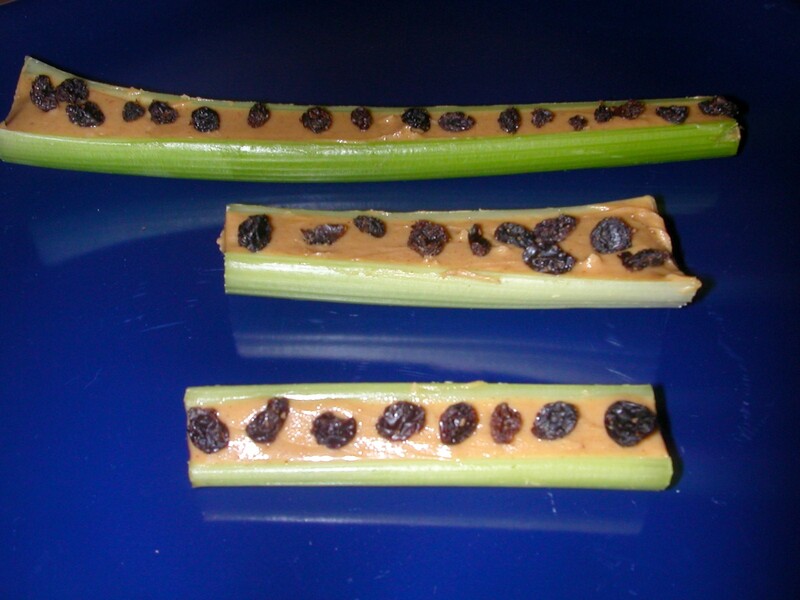 They are making “Ants on a Log” a snack that is good for them and tastes good too! It is also easy and fun to make. Here is the recipe, if you want to make it. Since the “Can Do”s cannot use a knife, Grandma Maureen cuts the celery in to two pieces for each “Can Do” Kid to fill. Each “Can Do” Kid washes and dries their celery pieces then fills them to the top with peanut butter. They each use a plastic spoon to scoop the peanut butter into the celery and then use the handle of the spoon to smooth out the peanut butter so it is even with the sides of the celery pieces. Then they take the raisins and line them up in a row to look like ants walking on a log. Once the “Can Do’ Kids are finished making “Ants on a Log”, they wrap them to carry to the community center. Before they leave Grandma Maureen’s they help clean up their work area. Do You Know About Service Dogs? Awhile back we introduced Muggins, Mickey’s service dog who guides Mickey when away from home. Did you know there are other kinds of service dogs besides dogs who guide children and adults who are blind? Some service dogs help children and adults who have a problem hearing and let them know about sounds that they need to respond to, such as a door bell. Other service dogs assist a child or adult in a wheelchair by picking up things that drop on the floor, opening the refrigerator or a cabinet, helping with getting clothes out of the dryer and other daily activities. Whatever the service dogs does, his or her main mission is to help the child or adult with a disability be safe and independent. Service dogs are not pets. They have important work to do. Every day they are on the job. Not every dog can be a service dog. Dogs that are smart, have good health and a good personality are often considered to be service dogs. They also need to have the physical ability to do what is needed and they have to be willing to do what is asked of them. Different kinds of dogs can be service dogs but Golden Retrievers, and Labradors are most often chosen to be trained as service dogs because they are smart and have easy going personalities. They make excellent service dogs as does a Labradoodle, which is a cross between a Labrador and a Poodle. They do not shed because they have hair, not fur. This makes them an ideal service dog for a child or adult that has allergies. Next time we will learn about how puppies become service dogs. Until then … keep making good choices to be safe, learn new things and have fun! Posted in Uncategorized | Comments Off on Do You Know About Service Dogs? What Can A “Can Do” Do? Hey “Can Do” kids, I’m Coach Campbell, but you can just call me Coach. At the recreation center I try to help everyone stay healthy, have a good time, and maybe…just maybe…learn some new things. I love being a coach and I want to help you stay active and be healthy. Whatever you like to do is great, as long as it keeps you moving. Any exercise is good for you and exercise can be FUN! That’s right, fun. What kinds of things do you like to do for fun? Do you have a favorite game you love to play? Is there an activity or a sport you would like to learn more about? To try? Let me know and we can work on it together. Just email me and we can get started! Posted in Uncategorized | Comments Off on What Can A “Can Do” Do? I am the coolest kid on “Can Do” Street. Skateboarding, swimming and using the computer are my favorite things to do. At first I didn’t want to to go to school , but ever since I started school I really like it. I’m a big talker and sometimes that gets me in trouble in school. Miss Pat, my teacher, has to tell me to be quiet and to raise my hand if I want to say something. I’m also a big eater and sharing my food is hard for me. My friends say if I’d share more, I’d weigh less. I think it is hard to share toys and school stuff, especially with my sister, Maria. I’m always getting in trouble for using her stuff without asking. Mostly my friends like having me around even though they have to keep reminding me that friends share. When you can, come to “Can Do” Street and watch me skate!